A true children’s classic, Winnie-the-Pooh is a heartfelt novella that continues to bring joy to all of its readers for nearly a decade. Following the adventures of Christopher Robin and his friends in the Hundred Acre Woods, Milne’s short stories are full of peculiar events and remarkably complex thoughts that the mind of a child will better understand that that of an adult. Will readers continue to fall in love with Milne’s ‘Bear of Very Little Brain’? Does this classic live up to children’s novel published today? 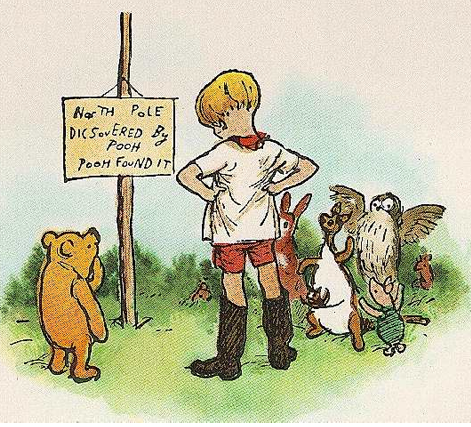 Let me just get ONE thing clear – anyone that doesn’t like Milne’s Winnie-the-Pooh…you are not NORMAL! Yes, be mad people – I don’t care! This is such a loving and carefree book, it’s yet another review that’ll probably be littered with random thoughts because I really don’t know how to keep them straight. If you read my book review on Antoine de Saint-Exupéry’s The Little Prince, you know how there are very FEW books that leave me in this comatose state – this is another example. Milne has this profound ability to reach the reader in a way that grabs their focus and grips at their soul…true story. This relates a lot to the specific language use and narrating style he chooses to use for the novel, among other things. For now, let’s start with the language and narration. NOT the next person who borrows it from the library, NOT the next person who buys it online, and NOT who recommend it to you…YOU are who the narrator is reading this to. When you first read the novel, the story’s set up in a second person point of view. The narrator is presumably Milne himself; who he’s reading to is a little more complicated. Milne’s reading all of these stories and speaking to Christopher Robin. At the beginning of the novel though, he’s reading to us…stating YOU multiple times to indicate that we’re whom he’s telling the story to. Once the bedtime stories of Winnie-the-Pooh and his friends in the Hundred Acre Woods begins, we switch to third person omniscient. Genius, am I right? What in the world are Piglet and Pooh doing when hunting a Woozle? Is that even hunting? What’s a Woozle??? WHY DOES NO ONE EXPLAIN THEMSELVES PROPERLY WHEN ASKED A SIMPLE QUESTION? WHERE’S THE LOGIC?!?! I ended up reading the novella again in third year for a Children’s Literature course a couple years later…of course NOW I get it. The book can be confusing at times…but only for adults. It’s written to reflect the mindset of a child, which Milne hints to you throughout the novella. Even Milne struggles with Christopher Robin’s explanation of how he came up with Winnie-the-Pooh’s name, since he really doesn’t give you a proper response. Things are just the way they are for children; adults always need some deeper meaning or connection or reason for something…but children don’t. This isn’t to say the world is black and white for kids, but it’s much less confusing and much more straightforward. We overthink everything as adults, which makes this book so much more complicated yet profound. I won’t go TOO deeply into the characters simply because discovering what mindset they present (adult, child, young adult, etc.) is one of the fun parts when reading the stories. The characters are rounded, developing throughout the novella by learning new things about one another and by lessons after one of their amusing adventures. The development is slow but it’s most likely deliberate. Milne wrote multiple stories set in the Hundred Acre Woods, each of the books geared specifically towards different stages of childhood development. With each new book, Christopher Robin and his friends learn something new that makes them that much wiser about the world. Honestly, I think it’s brilliant because it’s realistic. Children don’t develop a crazy amount overnight. Yes, they learn to talk and walk and so much more in a short period. But children learn certain lessons and gain different pieces of knowledge at very different yet fundamental times in their lives. It’s a wonderfully superb idea. I’ve now read this 3 times (possibly 4?) in the course of 7 years. It’s a small book with such a grandiose message behind it. Milne’s Winnie-the-Pooh brings us back to a life when things were simple, when the world was as big as our imaginations could take us. There’s a certain innocence children have…once you lose it, you don’t get it back. Once you learn about the world in a realistic point of view, you start to become an adult. It’s literature like this that gives you a glimpse into that past again, just a small peak into that beauty you saw in the world long ago. For those of you who have children, grandchildren, nieces, nephews, cousins…I truly believe this tale will bring so much joy and light into their life. Seeing the reactions on their faces to things told in Milne’s tales are absolutely hilarious and profound, seeing a sort of enlightenment they have that we don’t. It’s a beautiful story that will surely make you smile, letting you escape the troubles and worries of the adult world – even if it’s only for a moment. I do too! It always brings me so much joy when I read it!